So, after some waiting, finally my book with Indira Van’t Klooster is out! 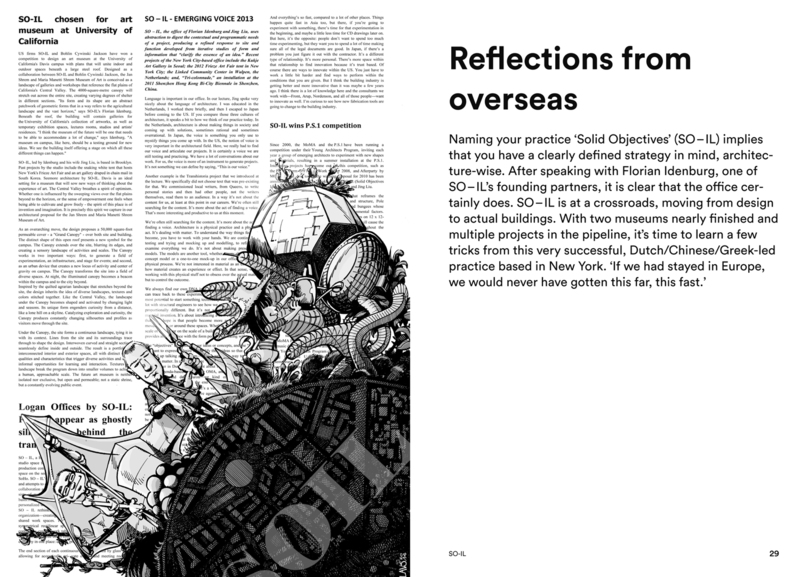 As you’ll remember, if you’ve been around for a while, back in 2014 Indira van ‘t Klooster, editor-in-chief of A10 magazine contacted me asking if I would be interested in making some cartoons for a series of interviews with different architects. This evolved into a series, published monthly in the magazine, which has now been (partially) compiled in the book Forty and Famous: 10 interviews with successful young European architects. The book features interviews with a series of relatively young practices comprising ALA (Finland), KOKO (Estonia), Barozzi / Veiga (Spain), SO – IL (USA), WWAA (Poland), ZUS, (Zones Urbaines Sensibles) and JDS (The Netherlands) Chartier Dalix (France), Jürgen Mayer H (Germany), and Assemble (England). Previews of all those can be found in the links above, or by clicking the A10 tag in this very blog. Some of these images might be familiar for the usual visitors here, but there are still a few unseen ones, such as Jurgen Mayer’s ‘Alice in Wonderland’ cartoon, or the cover featuring the whole line-up. The official launch in this year’s Biennale will take place at the Polish Pavilion, Giardini, Venice on May 27 between 11.00 and 11.30 am. A second event will take place in June 8, 20.00 pm, at Pakhuis De Zwijger, Amsterdam, The Netherlands. Presented in this book are 10 young European architecture practices. They all found, in the midst of the financial crisis, a new attitude, a hands-on practice, with great commitment and an eagerness to get things done, thinking large-scale against all odds. How did they succeed? By winning competitions (ALA, KOKO, Barozzi / Veiga), by finding new clients outside Europe (SO – IL, WWAA), by raising new issues (ZUS, JDS), by innovating typologies (Chartier Dalix, Jürgen Mayer H.) and by new types of organization (Assemble) – usually by mixing all of the above, after having been educated abroad for some time. This selection also shows the different circumstances in which they blossom, through clients in America, Asia and Georgia, post-communist courage in Central Europe and Estonia, bottom-up strategies in The Netherlands and England, an international Erasmus generation flowering in Spain, new traditionalists in France, the benefits of young-architect-friendly Finland, and cross-over markets in Belgium. 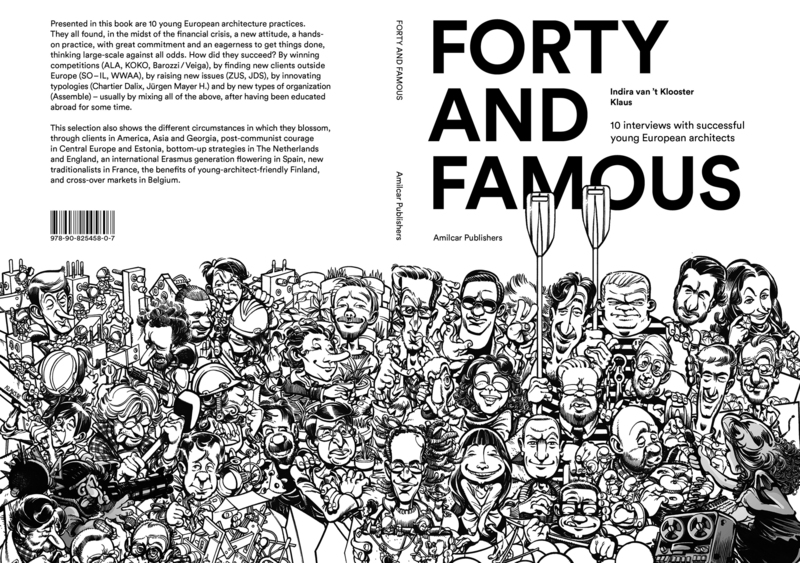 -Forty and Famous: 10 interviews with successful young European architects. Indira van’t Klooster. Illustrations by Klaus. Additional texts by Gonzalo Herrero Delicado. Amilcar Publishers, 2016. Between the KOKO office and the house of one of its partners is a tiny door. It’s invisible to who doesn’t know it, situated in the kitchen behind the dustbin. You have to bend deep to go through the door, designed to make it function like an Alice in Wonderland transformation. You enter from the one world to the other. ‘It’s so small on purpose, so that every time I enter it, I undergo some sort of transformation from private to work, from work to private life. As I do this 3 or 4 times a day, you understand how important it is.’ The story is illustrative of the way KOKO works. They feel comfortable in transforming big historical complexes, they have this way of adding something subtle and personal, and there is always a sense of relativity and humbleness. As if to illustrate that they are just one of the many tiny passers-by in many layers of time. Having regained independency (as the Estonians like to put it, rather than having become independent) in 1991, the country was ready for its first appearance at the World Expo, the Hanover Expo in 2000. The commission was won by KOKO architects, formed by a recently graduated artist and an architect not even out of the Academy. For what is better for a young nation than to be represented by young talent? Now the country is preparing the celebration on a 100 years existence of the Estonian nation (ignoring the Russian and German supremacy between 1918 and 1991), while Russian pressure is again clearly sensible at the Baltic borders. KOKO is looking for ways to expand their practice outside Estonia, for example in Norway and Finland, both countries that have heavily influenced Estonian architecture. And to close the circle: they have just completed the interior of another national pavilion: at the EXPO Milan. What made you win the World Expo competition in 2000, do you think? We proposed a maritime theme to connect to the naval history of Estonia and maximum visibility so as to stand out between all the other countries. The result was a flowing movement high above the visitors’ heads, an undulating forest of fir trees, symbolizing both sea, woods and movement. The spectacular result was an instant success: 2.7 million came to visit the pavilion. For us ‘movement’ has become a recurring feature in our work. Not literally, but metaphorically. In this country every 30 years everything changes drastically. We don’t think that buildings or designs will keep their original functions for much longer than that. Pascale Dalix and Frédéric Chartier started their office 10 years ago. Coming from big offices like Herzog & De Meuron and Dominique Perrault it’s easy to recognize where they learned to play with surfaces and how to combine rationality and poetry. The shiny surfaces of the Young workers’ hostel, crèche and studios in Paris are quite different from the edgy facades of the Sciences and Biodiversity school in Boulogne-Billancourt (France), but the reasoning behind them is the same: ‘It’s the first question to ask and the last to answer, because we keep researching on better solutions during the process: ‘How can we enrich the program?’, say Frédéric Chartier and Pascale Dalix. Since 2010 they have finished 10 projects with an office of 30 people. As such it is a fast growing office that likes to work in teams. Still, it’s a lot of buildings. One explanation is the way they like to collaborate with other architectural practices. Collaboration makes it possible to work on many buildings at the same time, as well as to experiment a bit with different styles and materials. Their oeuvre as such is not exactly homogeneous, but each building offers a fresh approach. What connects them is their fluidity of spaces: voids and floors interact of various functions and various scales. How can you enrich the program? We tend to treat our buildings as vertical micro-cities. French cities are so dense, we need to create valuable human living spaces in high quantities. This is only possible when we can also make a sort of recluse. A place that extends the city inside the building itself. To be able to do that within the strict budget limits we have learned to play with structures and spaces. What’s the reason that you seldom use the ground floor for public amenities? (*) As usual, there’s more to be found in the magazine itself.